Broken Spoke Bike Co-op | Find Your Daughters, ’cause Beryl’s Back in Town! Find Your Daughters, ’cause Beryl’s Back in Town! Have you heard the news? The rumours are true: Beryl’s back in town! Team Beryl is pleased to announce that we’re re-launching our women and trans-only bike repair nights at The Broken Spoke Bike Co-op. We strive to create an inclusive and super welcoming space at The Broken Spoke at ALL Open Workshops (Fridays through Sundays every week), BUT, we know that learning any new skill can be intimidating, and that mechanics for the newbie (or the rusty) can sure be a doozy! At our monthly Beryl’s Night, the workshop will open its doors to women and trans-folks only. Bring your girlfriend, your housemates, your mum, and your buds n’ pals to learn a thing or two about fixing up your bike! 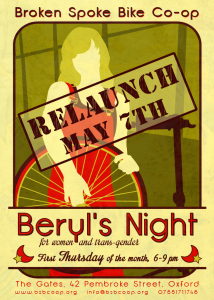 Whether you’re interested in knowing more about maintaining your sweet ride, or just want to generally hang out with a great gang in a safe space, we hope you’ll join us on May 7th for the relaunch of Beryl’s Night. Did we spark your interest? Let us know through our survey. Each week we’ll set a mechanical theme that’ll be advertised through the Beryl’s Night website and the Broken Spoke Newsletter (subscribe here). We’ll have a hands-on class from 6.15 – 7pm which is going to be followed by two hours of open workshop. All that for ￡5 per person. You might also want to follow us this summer as we launch a wicked summer of women and bike mechanics (together at last, where they belong!). We hope to see your shining faces at the Abingdon Cycle Festival (April 19th), our fix-your-bike stall with Rose Hill and Iffley Low Carbon (May 2nd), Oxford Pride 2015 (June 6th), and The Earth Trust UpCycling Festival (June 7th), and who knows what else! Remember, tell your friends to save May 7th for the first Beryl’s Night of 2015. (Absolutely) no previous knowledge of bike mechanics necessary, and all experience levels warmly welcome!